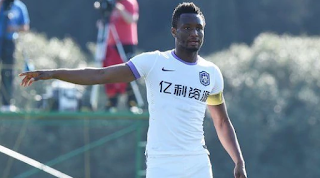 Super Eagles captain Mikel Obi handed Gernot Rohr a major boost ahead of the 2018 World Cup qualifier against Cameroon after he featured in Tianjin Teda’s 2-0 defeat at home to Hebei CFFC in the Chinese Super League on Monday, Completesportsnigeria.com reports. A goal in each half from Ezequiel Lavezzi condemned Tianjin Teda to their 12th defeat of the season. Tianjin Teda have also failed to win in their last nine games in the CSL.